Social Media: Which Channels Work for My Business? On the other hand, we love connecting, sharing and liking too much to completely unplug. In fact, 70 percent of Americans have at least one social media account. As a business owner, the takeaway is clear. Social media isn’t something you can afford to ignore. Platforms, such as Facebook and Twitter, are where your customers congregate. If you want to engage with these users, it’s where you need to direct your marketing and advertising resources. Let’s explore some of the top social media platforms — and which ones you should be using to grow your business. As the largest platform on the list, Facebook is practically synonymous with the term “social media.” Roughly 75 percent of all U.S. adults have an account. This number jumps to 94 percent among those between ages 18 and 24. Better still, three out of every four Facebook users visit the site at least once a day. You probably don’t think of YouTube as a social media platform; however, it definitely fits the mold with its user-generated content — complete with comments, sharing and liking. In fact, it’s arguably the largest social media platform in the world, given that 500-plus hours of video are uploaded every minute. With nearly 500 million users, Instagram (owned by Facebook) is an exclusively mobile platform that relies heavily on visual assets, such as photos and videos. It’s not nearly as popular with Gen Xers and Baby Boomers — but good luck trying to find a millennial in the United States who doesn’t regularly post, share or like Instagram content. Twitter proudly boasts over 260 million users worldwide and an impressive 70 million in the U.S. The allure of this popular platform is that you can broadcast concise 280-character messages to everyone who follows you. This is great if you ever want to announce upcoming product launches and events. Snapchat’s whole shtick is that posts and messages disappear in 24 hours. As such, this social media platform isn’t great for evergreen content, but it’s seemingly tailor-made for breaking news and buzzworthy items. Pinterest is similar to Instagram, but the emphasis is on organization and keeping “digital bulletin boards” of your likes and interests. That’s a pretty niche market, but don’t tell the 250 million active users who log on every month. LinkedIn has more than a quarter billion active users who rely on the company’s business-networking platform. It’s probably not the best choice for teen engagement, but if the goal is to connect with corporate decision-makers and potential employers, LinkedIn is an indispensable tool. In a perfect world, you would use all of the above tools — plus many more that didn’t make the list (e.g., Google Plus, Flickr and Tumblr). Yet, total saturation is impossible given that effective social media marketing requires constant, ongoing nurturing. Only the biggest firms can afford to bring on full-time social media teams. 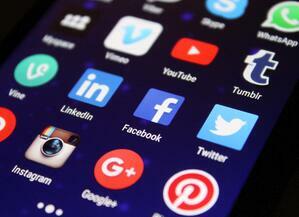 Everyone else must prioritize, so which social media platforms deserve your attention? Well, it’s hard to imagine any scenario in which Facebook wouldn’t factor into your social media outreach. For every five minutes that the average person spends on his or her mobile device, one minute is devoted to Facebook. So, as a business owner, ignore Facebook at your own risk. Deciding who you want to reach will help you determine which social media platform is best for your business. Eighty-one percent of Pinterest users are women. Seventy-one percent of Snapchat users are younger than 34. LinkedIn is almost exclusively for business professionals. If you’re looking for insights, Pew Research Center has some fantastic demographic breakdowns of social media platforms and their respective user bases. 2. What Is Your Marketing Goal? If the goal is to convert customers on the spot, social media shopping has just started to grow in popularity. Typically, most users visit these platforms for fun and entertainment, but now 25% of business owners are selling through Facebook and other channels. Even if you’re not selling your products or services directly on the channels, social media can still play a powerful role throughout the buying cycle — especially for those who are in the discovery and research stages of their journeys. If your goal is to raise awareness — nearly any social media tool will do the trick. Though, if the goal is to drive traffic to your site — few platforms can hold a candle to YouTube, whose videos often appear in organic search rankings on Google, Yahoo and Bing. As a bonus, YouTube is also the second-largest search engine in the world (after Google). 3 What Are You Trying to Sell? Businesses that specialize in beauty, fashion, food and travel should take a close look at Instagram and Pinterest — both of which are ideally suited for visual content. If you sell to the B2B crowd, however, it would be a mistake to overlook the power of LinkedIn. Are product reviews central to your marketing efforts? If so, YouTube is the place to connect with potential customers. Plus, given the ephemeral nature of Snapchat, this is the platform of choice for short-term deals, special promotions and one-off events. Want to See More Social Media Tips? Social media is a massive industry that can’t easily be compartmentalized in a brief write-up like this. If you’d like to see even more social media and other marketing tips for growing your business, follow our blog. Oh — and don’t forget to follow us on Facebook, Twitter and LinkedIn.